This side-gabled Craftsman Arts & Crafts Bungalow has a gabled extension over the entry porch to the right front and a small shingled, gabled dormer to the left. Heavy knee brackets support the front and rear gables, while flat brackets support the side gables. There are exposed rafter tails, and the bargeboards on front and sides are notched. A stringcourse on the porch gable separates stucco and half-timbering above from double-coursed shingles below. A Tudor arch on heavy rustic granite piers supports the porch roof. The Craftsman front door, with leaded and stained glass side-lights, has an inset leaded window, and hammered Arts & Crafts brass handle and strap hinges. The picture windows on either side of the door have stained glass transoms which match the glass in the side-lights. Granite balustrades on either side of the entry stairs run between the porch piers and extend to the left corner of the house. The cladding of the side gables mimics that of the porch gable. There is an angled, one-storey bay on the left side below a shallow hipped roof; its centre window has a stained glass transom matching the front windows. There are two angled bays, one above the other, on the rear. The main floor is clad in bevelled siding; the foundation is concrete. There is an exposed granite chimney with red pointing on the left side of the house; another granite chimney is located on the front to the right of and behind the porch gable. The house retains its granite gateposts. The house is now part of an apartment/condo complex and is joined to the adjacent buildings on either side. It has been owned by the Coté family since the 1970s. Jud Yoho was a Seattle architect who sold plans through various publications, including the Bungalow Magazine and the Craftsman Bungalows catalogue. 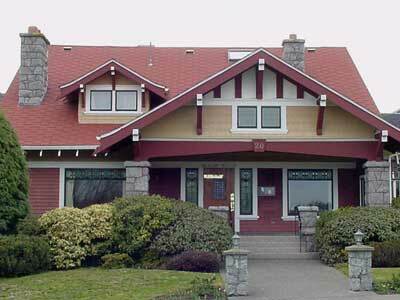 This house is a mirror image of 27 Olympia Av, James Bay, also built by the Bownass family. 1911-30: William Bownass (b. Yorks, ENG c.1847-1930) and Charlotte (née Lancaster, b. Yorks, ENG c.1853-1927) came to Victoria from ENG in 1892 with their son John, who later moved to Toronto. A plumber, William was proprietor of Bownass Hardware on Government St at Broad St; in October 1910 he lost his building in the Five Sisters Fire. Later he worked until his death as a bookkeeper for plumber John T. Braden. Bownass was well-known for cycling to work every day. 1938-43: Katharine Agnes Welstead (b. Faccombe, Hants, ENG 1857-1943) came to BC in 1923, residing in Cobble Hill for 15 years. She then came to Victoria, and lived in this house until her death.